Holography is simultaneously one of the most well-known and yet most misunderstood optical techniques. The word hologram derives from the combination of two different Greek words “holo” meaning “whole” and “gram” meaning “drawing.” Understanding the origin of the word itself helps to illustrate that a hologram is not just simply a three-dimensional photograph, but instead, it is a recording of “the whole” wavefront reflected or transmitted by an object including both its amplitude and phase. While the phase and amplitude of the wavefront can most certainly be utilized to recreate a three-dimensional image of the object, it is also useful in many other applications; including aberration correction and image processing. To take full advantage of the potential phase manipulation properties of holographic imaging, it is necessary to capture the hologram digitally. Although digital holography was first demonstrated over 50 years ago by Joseph Goodman and Robert Lawrence, it wasn’t until the advent of modern high-resolution CCD and CMOS imaging detectors that the technique started to become commonplace. Today digital holography is used in a wide range of applications ranging from holographic aperture ladar (HAL) to vibration analysis; this blog post is going to focus on its utilization in microscopy for life sciences. In a previous blog post titled “The characteristics of lasers for Holography” we provided a detailed analysis of holography fundamentals, as a result, we are not going to spend to much time on fundamentals in this blog. In this post, we will instead focus specifically on typical digital holographic microscopy configurations and applications. Many of these examples will be taken from the 2010 review article from Vincente Micó et al. titled “Basic principles and applications of digital holographic microscopy,” therefore we highly recommend you to reference this article for a more detailed analysis of the topics covered in this blog post. One thing that all holographic set-ups have in common is the need to interfere two laser beams at the object, in digital holographic microscopy, this is typically accomplished by splitting a long coherence length laser and directing it simultaneously through both the upright and inverted illumination paths causing the two beams to interfere at the object plane of the microscope. A second beam splitter is also placed in between the camera and the objective to serve as a reference beam creating an interference pattern at the detector plane to measure the phase of the incoming wavefront. An example set-up is shown in the figure below illustrating this arrangement in more detail. This diagram was reproduced from the aforementioned review article, by Vincente Micó et al. Once the hologram produced by the microscope is digitized, it is a simple process to perform a fast Fourier transform (FFT) on the digitized image to be able to identify and then manipulate the phase. After the image is filtered in the Fourier domain, an inverse-FFT can then be performed to produce the processed image. One of the most significant advantages of this method is that a full phase map can be generated by looking at the imaginary part of the FFT. The phase map allows for the exact amount of wavefront aberration to be determined and then digitally corrected, therefore creating a diffraction-limited image of the object under investigation. Additionally, the Rayleigh-Sommerfeld diffraction equations can be applied to the complex amplitude to recreate the image as a function of the z-axis. This processing technique can produce either individual image “slices” as a function of depth of field or complete three-dimensional topographical images of the object similar to the traditional film-based holography which most people are familiar. 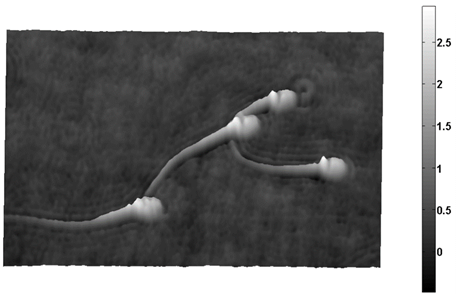 The picture below shows an example of a topographical grayscale digital holographic image of swine sperm, from the same aforementioned review article. In the review article, they go on to also demonstrate how dark field images, phase contrast images, and a wide variety of other classical optical imaging techniques can be mimicked by mathematically filtering the FFT of the image before transforming it back into image space. To effectively produce digital holographic microscopy images, it is essential that the laser source not only have a TEM00 beam profile, as in fluorescence microscopy, but it must also have an extremely long coherence length and stable power output. These properties are important because any fluctuations in the phase or amplitude of the laser signal will result in distortions of the interference pattern at the image plane. Here at RPMC Laser, we are proud to offer the LCX series of single longitudinal mode DPSS lasers from Oxxius, which are ideal for integration into digital holographic microscopes. These lasers are available at 532 nm, 553 nm, 561 nm, 640 nm, and 1064nm with coherence lengths greater than 100 m and power fluctuation of less than +/- 1% over 8 hours of operation. 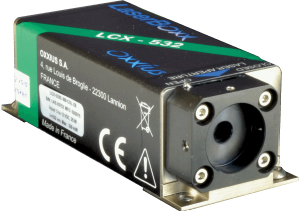 These compact, self-contained laser modules utilize Oxxius’ proprietary, alignment-free monolithic resonator. The elements in the cavity are assembled into a single ultra-low-loss optical subsystem, using a proprietary crystal bonding technique providing unprecedented stability and reliability. The LCX series provides a TEM00 output beam with output power up to 500mW and outstanding pointing stability. They are designed with an industry standard 32 mm height and come standard with a graphic user interface with remote diagnostics via USB, RS232, or direct I/O interface. The OEM version can operate at baseplate temperatures between 10 °C to 50 °C and come standard with integrated drivers requiring only 5 V to 12 V DC external power supply. For detailed technical specifications on the LCX series of single longitudinal mode DPPS lasers from Oxxius click here or talk to one of our laser experts today by calling 1-636-272-7227.